, an eminent modern architect, was born at Burton, in the county of Stafford, about 1743, of a respectable family, which is now become perfectly patriarchal in its numerous and extensive branches. 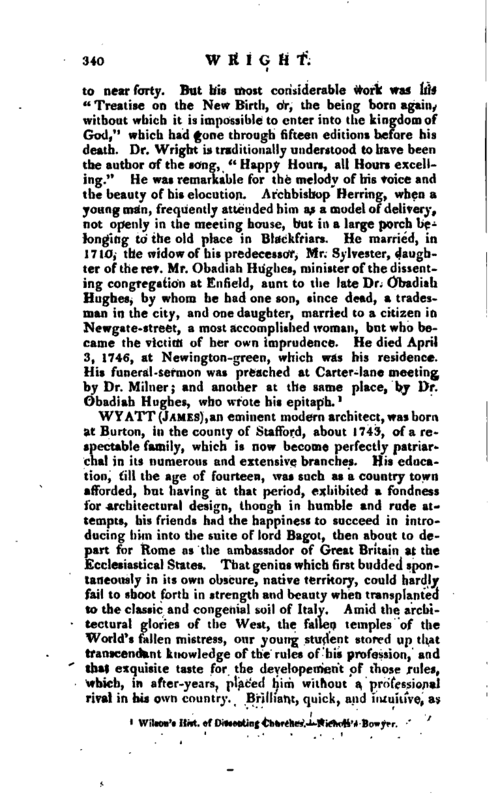 His education, till the age of fourteen, was such as a country town afforded, but having at that period, exhibited a fondness for architectural design, though in humble and rude atlempts, his friends had the happiness to succeed in introducing him into the suite of lord Bagot, then about to depart for Rome as the ambassador of Great Britain at the Ecclesiastical States. That genius which first budded spontaneously in its own obscure, native territory, could hardly fail to shoot forth in strength and beauty when transplanted to the classic and congenial soil of Italy. Amid the architectural glories of the West, the fallen temples of the World’s fallen mistress, our young student stored up that transcendant knowledge of the rules of his profession, and that exquisite taste for the developement of those rules, which, in after-years, placed him without a professional rival in his own country. Brilliant, quick, and intuitive, a2 | was his genius, he was never remiss in investigating and making himself master of the details and practical causes by which the great effective results of architecture are produced. He has been heard frequently to state that he measured with his own hand every part of the dome of St. Peter’s, and this too at the imminent danger of his life, being under the necessity of lying on his back on a ladder slung horizontally, without cradle or side-rail, over a frightful void of 300 feet. From Rome he departed for Venice, where he remained above two years a pupil of the celebrated Viscentini, an architect and painter. Under this master he acquired a very unusual perfection in architectural painting; and he has executed a few, and but a few, paintings in that line, which equal any by Panini. 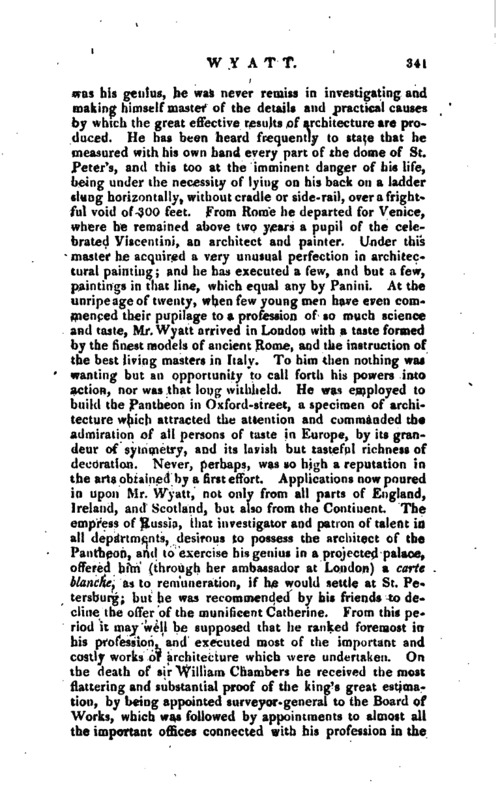 At the unripe age of twenty, when few young men have even commenced their pupilage to a profession of so much science and taste, Mr. Wyatt arrived in London with a taste formed by the finest models of ancient Rome, and the instruction of the best living masters in Italy. To him then nothing was wanting but an opportunity to call forth his powers into action, nor was that long withheld. He was employed to build the Pantheon in Oxford-street, a specimen of architecture which attracted the attention and commanded the admiration of all persons of taste in Europe, by its grandeur of symmetry, and its lavish but tasteful richness of decoration. Never, perhaps, was so high a reputation in the arts obtained by a first effort. Applications now poured in upon Mr. Wyatt, not only from all parts of England, Ireland, and Scotland, but also from the Continent. The empress of Russia, that investigator and patron of talent in all departments, desirous to possess the architect of the Pantheon, and to exercise his genius in a projected palace, offered him (through her ambassador at London) a carte blanche, as to remuneration, if he would settle at St. Petersburg; but he was recommended by his friends to decline the offer of the munificent Catherine. From this period it may well be supposed that he ranked foremost in his profession, and executed most of the important and costly works of architecture which were undertaken. On the death of sir William Chambers he received the most flattering and substantial proof of the king’s great estimation, by being appointed surveyor-general to the Board of Works, which was followed by appointments to almost all the important offices connected with his profession in the | government departments; and a dispute having arisen in the Royal Academy, which induced Mr. West to relinquish the president’s chair, Mr. Wyatt was elected, and reluctantly obeyed his majesty’s command to accept the vacant office, which he restored to Mr. West the ensuing year. 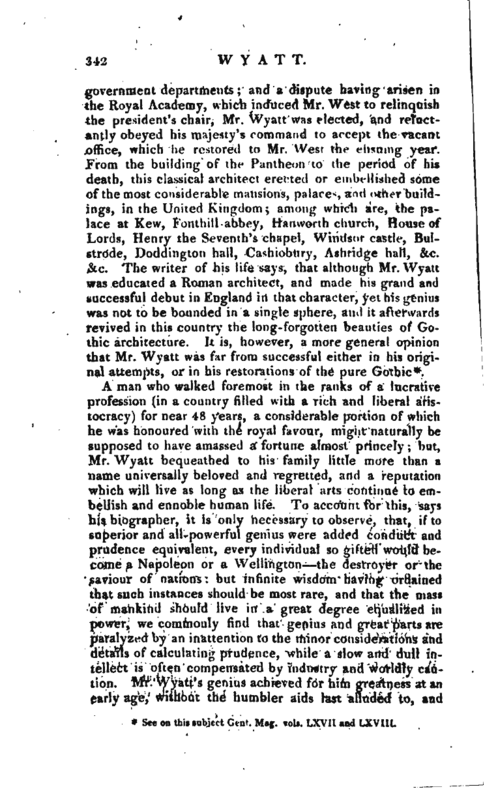 From the building of the Pantheon to the period of his death, this classical architect erected or embellished some of the most considerable mansions, palaces, and other buildings, in the United Kingdom; among which are, the palace at Kew, Fonthili abbey, Hanworth church, House of Lords, Henry the Seventh’s chapel, Windsor castle, Buistrode, Doddington hall, Cashiobury, Ashridge hall, &c. &c. The writer of his life says, that although Mr. Wyatt was educated a Roman architect, and made his grand and successful debut in England in that character, yet his genius was not to be bounded in a single sphere, and it afterwards revived in this country the long- forgotten beauties of Gothic architecture. 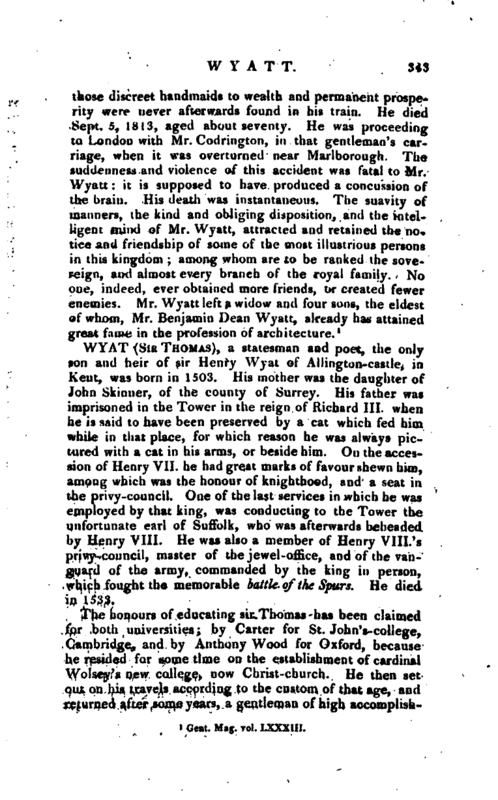 It is, however, a more general opinion that Mr. Wyatt was far from successful either in his original attempts, or in his restorations of the pure Gothic*. * See on this subject —Gent. Mag. vols. Lxvh and Lxvhi.